The DCEU (DC Comics Extended Universe… not a great acronym) has had some very obvious growing pains. When you start off with the dour Man of Steel and follow it up with the even darker and nonsensical Batman v Superman: Dawn of Justice, your cinematic universe is going to seem like a joke compared to what Marvel has managed to do. After the critical nadir of Suicide Squad in the summer of 2016, things started to turn. Wonder Woman was a massive success, a huge crowd-pleaser worthy of the icon’s first feature film. Just last December, Aquaman proved everyone wrong and made over a billion dollars worldwide. Suddenly, Wonder Woman and Aquaman were the faces of DC, not Batman. General audiences might be tired of Batman and Superman, at least in this current iteration. 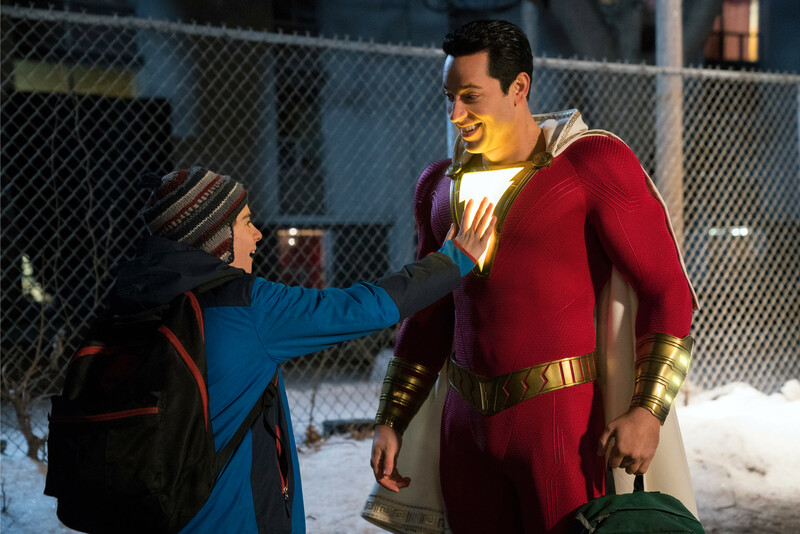 Hoping to ride this weirder wave of success comes Shazam!, the first film about the hero formerly known as Captain Marvel, who is a regular teenage boy granted superpowers from an old wizard. Yeah. Directed by David F. Sandberg, Shazam! is a delightfully lighthearted adventure that never gets too apocalyptic for its own good. Asher Angel plays foster kid Billy Batson, a runaway searching for his birth mother, who ends up inheriting the powers of a wizard known as Shazam. When he speaks the wizard’s name, he is transformed into an adult hero wearing a red suit and white cape, played by Zachary Levi. The ripped-from-the-comics costume leaves a bit more of an impression than Levi, but he plays up the “Oh my god I’m a superhero” aspect pretty well. Jack Dylan Grazer plays Billy’s foster brother Freddy, a true superhero geek who’s very excited to test Billy’s newfound strengths and post them to YouTube. Like every superhero movie, Shazam! is about fifteen minutes too long, with a third act that drags. But the second act, where Billy and Freddy are discovering the range of Billy’s new powers, is absolutely delightful. Mark Strong’s stoic villain Dr. Sivana is fairly intense with a thematically powerful backstory, but his CGI army of monsters doesn’t do much to stand out from similar baddies. Shazam! succeeds where other DC movies have failed: it’s truly fun. I’d love to see more of Billy and Freddy’s low stakes superhero adventures, as long as they keep their dynamic interesting and goofy. We don’t need these kids to turn into Batman. Fortunately, considering the truly ridiculous villain that gets introduced in the mid-credits scene, we won’t have to worry about that.